But, and here's where it gets fun, any "making" and sharing what you make counts: a video, a podcast, graphics, a Pin Board on Pinterest, a Storify, a meme, photograph, photo editing or hacking image, combining media in mashups. Think of all the possibilities using Halloween and Día de los muertos images. Installations, performances. Where have all the happenings gone? More conventional "makings" count too: writing a letter to the editor or an op-ed, signing petitions. IRL: posters and flyers on and off campus. You can wear your message too. 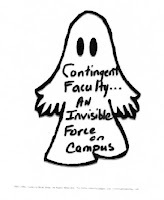 Last CEW, 2011, Alan Trevithick and Company wandered the Westchester Campus as ghosts or wearing ghost logos. 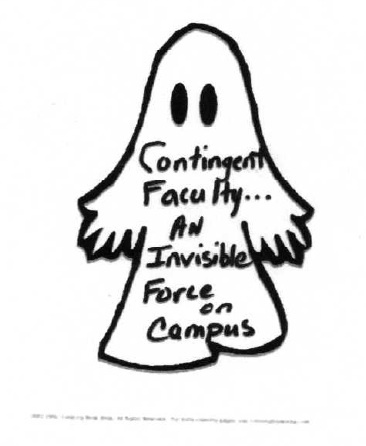 I wonder if anyone is baking CEW2013 cookies, perhaps even adapting the Halloween Pumpkin Spice Bread House to a campus theme, classroom or building o making ghost cupcakes...the ghosts would have liked that. Whatever you do for CEW, tag for easier finding, share it on social media, to groups and by email. That could be a problem with cupcakes and other edible unless you take and post pictures. There's more in the Campus Equity Week page's Take Action handout, as well as other resources on the page. Here's a link to Ana M Fores missing Rate Your School Report Card, not linked on the handout. Contact Ana on Adjunct Justice if you need the Report Card form in document or pdf file format. You can also check out what other campuses are doing. Imagination is still your best tool-kit though. I wanted to post a picture of the ghost cupcakes but couldn't decide which ones... we should send them to Alan - and could post a pictures in the comments on FB. 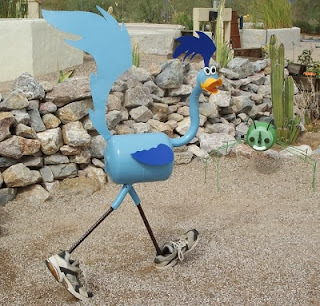 That roadrunner is the prize though and probably why I ended up blogging - I had to use it. Tables are such common place CEW features. Maybe they need special refreshment ideas and decorations to perk them up. I've been collecting for the local page but will take another look with an to CEW - a food post, that would be different. Wonderful post! Just trying to catch up reading now.